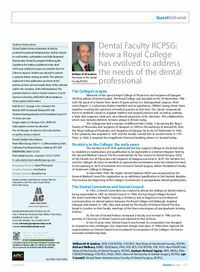 Abstract: Welcome to this special Royal College of Physicians and Surgeons of Glasgow (RCPSG) edition of Dental Update. The Royal College was founded on the 29 November 1599 with the grant of a charter from James VI given jointly to a distinguished surgeon, Peter Lowe (Figure 1), a physician, Robert Hamilton and an apothecary, William Spang, those three together covering the spectrum of medical practice at that time. Author notes: William M M Jenkins, DDS, FDS RCPSG, FDS RCS, Past Dean of the Dental Faculty, RCPSG, Richard Welbury, MBBS, BDS(Hons), PhD, FDS RCS, FDS RCPSG, FRC PCH, Hon FFGDP, Past Dean of the Faculty of Dental Surgery, RCPSG, Graham Richard Ogden, BDS, MDSc, PhD, FDS RCPS(Glasg), FDS RCS, FHEA, FRSA, Dean of the Faculty of Dental Surgery, RCPSG, Lyn Cranwell, Dental Team Administrator, Faculty of Dental Surgery, RCPSG.